Lions tailing is when interior branches and sprouts are removed along a stem or trunk. This is an incorrect pruning practice because these interior branches are functional parts of the tree. These branches produce carbohydrates that help with branch/stem taper. Branches/stems with good taper are less prune to failure during storm events vs. branches/stems that have little variance in stem diameter throughout their length. During hot days leaves on the exterior of the crown close their stomates to prevent water loss. While stomates are closed photosynthesis stops, and these leaves no longer produce food. However, these exterior leaves shade the interior of the canopy, keeping it cool. The interior leaves will continue photosynthesis. There are few reasons to prune branches on the interior of the canopy outside of pruning crossing and rubbing branches. If crown thinning is required, the cuts should be made closer to the branch ends to help alleviate weight on the branch (in my opinion). While the picture below isn't great, it is a good example of what not to do when pruning a branch. 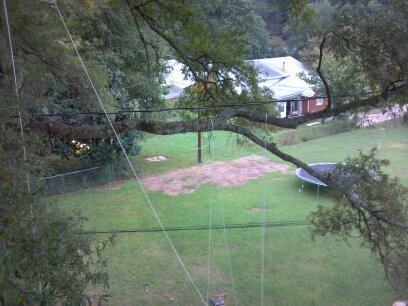 Wedding decorations are being hung from this branch, so we may be lenient on the arborist that performed the pruning. Labels: arboriculture, crown thinning, lions tailing, pruning, tree structure. Keeping sprout growth in the interior of the crown also helps buffer wind loads by dampening frequencies. Less is always more when pruning.